Becoming the princess of a Renaissance festival isn't easy! After all, there are plenty of little girls who are all vying for the title of princess. If you want your girl to stand out, then you're going to need to teach her all of the rules of being a princess, like being kind of heart, seeing the true beauty in people and remaining humble, despite being totally fabulous. Of course, she's going to need a really great dress to match her elegant personality and we have just the thing for her! 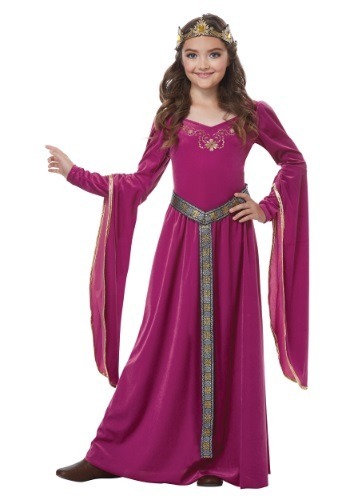 This girls Medieval Princess costume is just the type of princess regalia that your little girl will need to stand out in the crowd! The dress has a lush and vivid fuchsia color and a classic Renaissance-style design, which certainly lets everyone know that their new princess has arrived. Gold colored detailing across the neckline and and a matching gold belt add more regal touches to the look, while bell sleeves make for a signature Medieval look. Once your girl has it on, she'll be ready to take her rightful place in the kingdom...or at the very least, she'll be the best looking little princess at your next big adventure to the Renaissance fair.